Quiche is a great brunch dish, but why not try them tiny as appetizers or a snack? When you have bits of veggies or meats to use up, instead of making one large quiche you can make minis as appetizers or tuck them into the kid’s lunches instead of sandwiches. What I love about these tiny quiches is that they are easily customizable, so you can make the egg and milk base but then change around the fillings to whatever you like. In this case, I combined bacon, swiss cheese, and mushroom and then went for spicy with dried chorizo sausage, cheddar cheese, and sweet red pepper. They are so quick and easy to make, you’ll have a pan full of tasty little snacks in no time flat. Place the tart shells (leave them in their foil cups) on a rimmed baking sheet. Divide the filling ingredients between the shells. You don’t want them overloaded, but a bit in each is good. I always like more cheese than most people, so I used approximate measures. The point is you can use almost any filling you want, but make sure they are chopped into tiny pieces. In a bowl, whisk together the eggs and milk. Spoon into the cups, leaving a little room at the top because they will puff up and you don’t want them to overflow. It is much easier if you have a Pyrex glass measuring cup for this step. 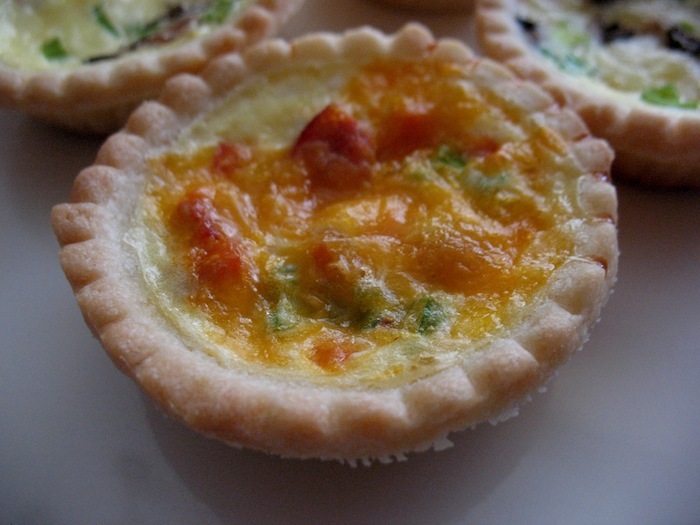 Bake the mini quiches for about 15-18 minutes, until the pastry is lightly browned and the eggs are set. Remove from the oven and let cool. Keep the quiches in the fridge in a sealed container. You can make these the day before you plan to eat them, and they also freeze really well in a sealed, airtight container.